In our house Sunday night dinners are not flash. They usually consist of scrambled eggs or fridge leftovers. But since I embarked on this cooking extravaganza Sunday nights dinner have been a bit more fancy. Tonight we took a trip back to 2002 and 2003 and enjoyed Ravioli with roasted pumpkin & herbs and Panna cotta with roasted plums. One word = yum! 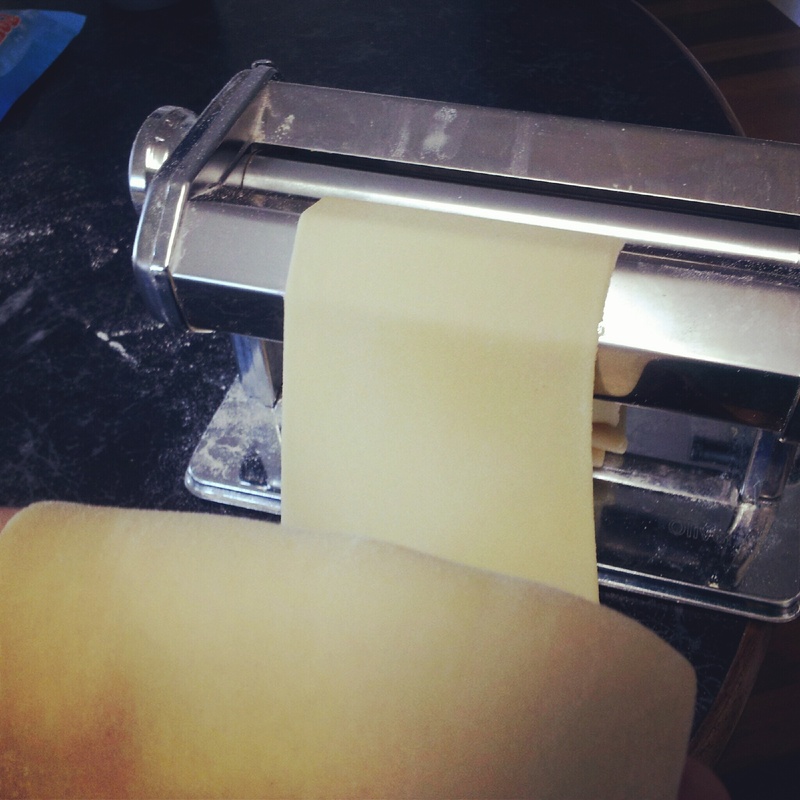 I have made fresh pasta before, and in fact, the recipe calls for fresh, shop bought lasagne sheets a la Latina style. 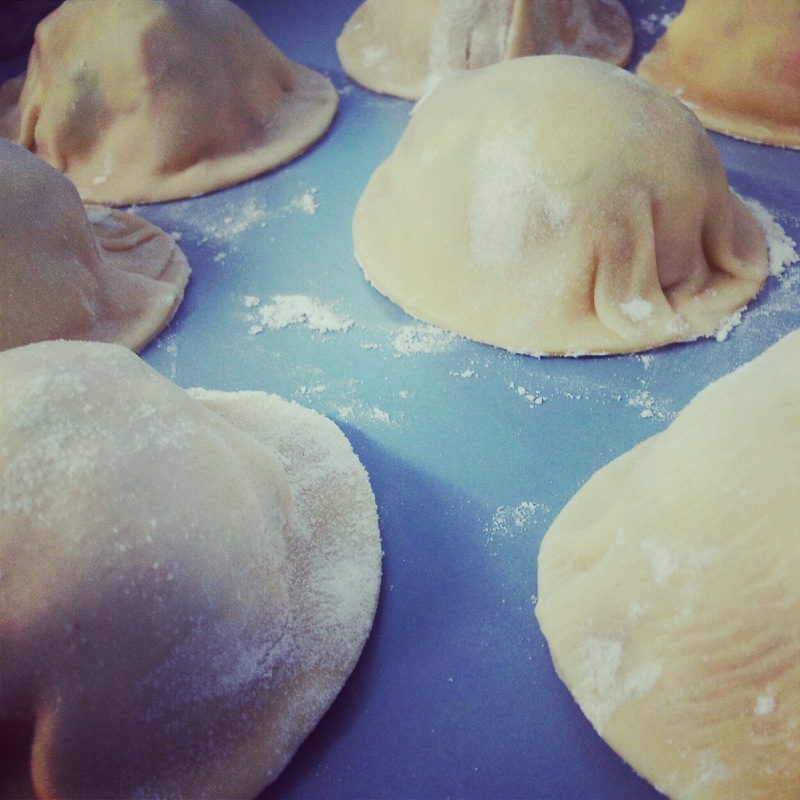 But I chose to make my own using my faithful Jamie Oliver basic pasta dough recipe. It’s a simple recipe – 100gm of strong “00” flour to each egg. Make as little or as much as you like. I use my food processor so it is whizzed together in a moment. I make enough for six so I can freeze half. Once you’ve made it a few times it is simple. The hardest part really is the rolling out and getting the texture smooth and silky. 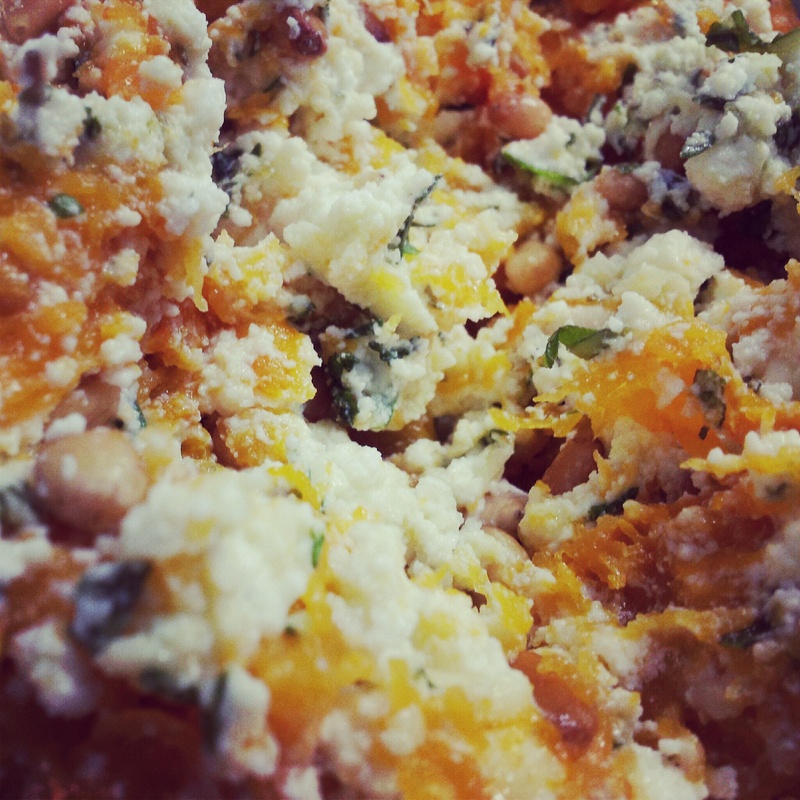 The filling for the ravioli is a simple mix of roasted butternut pumpkin, ricotta, egg yolk, parmesan, toasted pine nuts, fresh herbs (I used sage, basil and thyme) and a pinch of nutmeg (which I forgot – whoops!). I’m not a fan of butternut pumpkin. I find it kind of stringy. I prefer the blue or jap and would probably use that next time. Any herbs will do. Whatever you like to eat. Fresh from your own garden is even better! 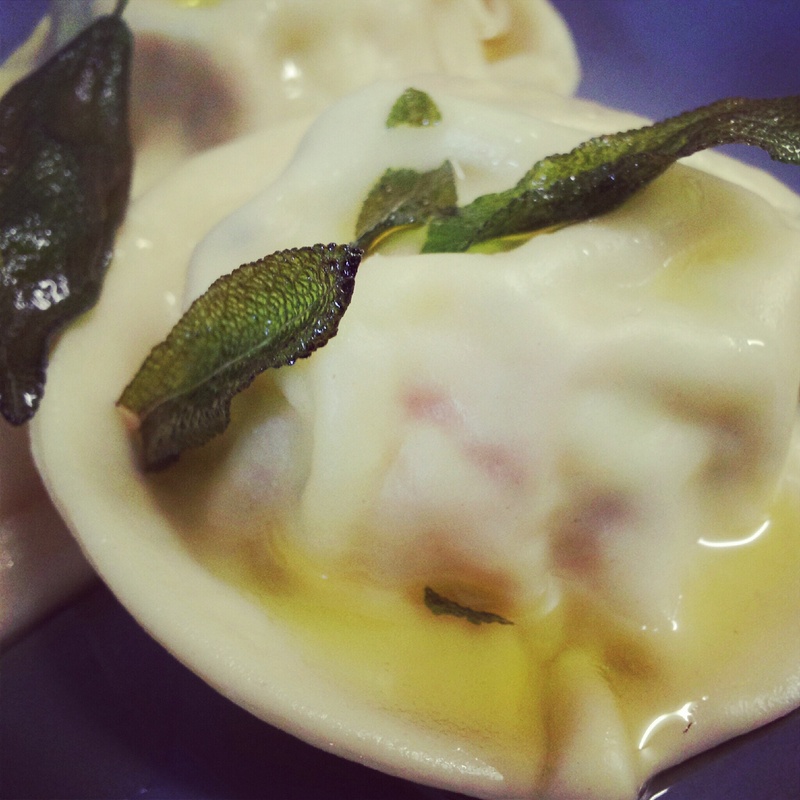 While you are boiling your ravioli in salted water (4 or 5 minutes until they rise to the surface) you can make the sage flavoured oil by warming your extra virgin olive oil and dropping in a dozen sage leaves till they sizzle and crisp up. 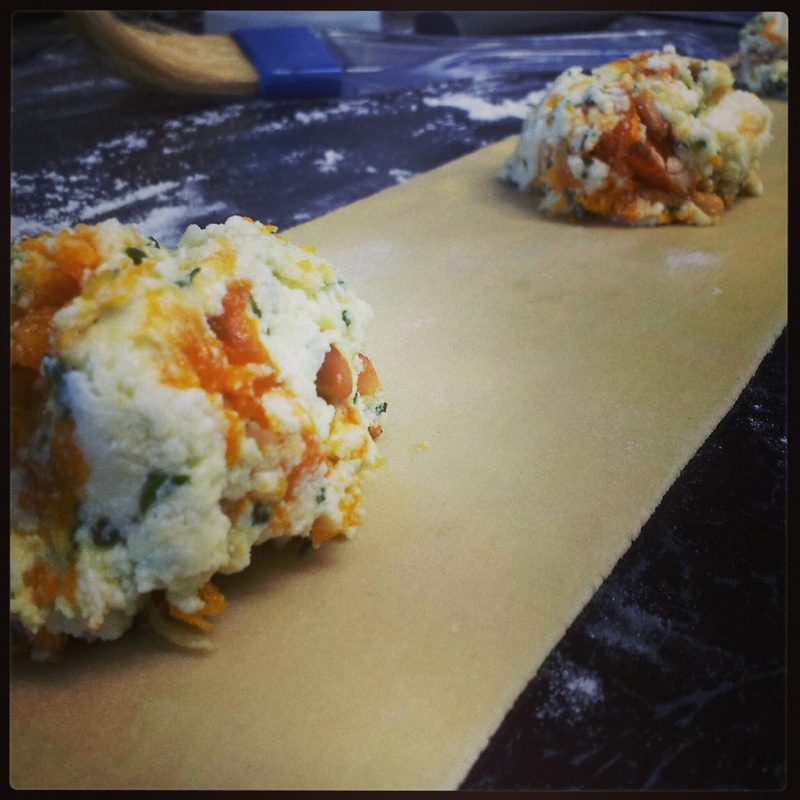 The result is perfect little pillows with a sweet and savoury pumpkin and cheese filling. Really delicious. Give it a go! Now for the panna cotta. Confession! This recipe is SO easy I actually whipped it up 15 minutes before I went to bed on Saturday night. I’m not sure why I thought it would be more difficult. Maybe it’s Masterchef’s fault. Or Matt Preston. You’ve got to get your “wobble” right. Miraculously, I did. While I was cooking dinner last night I made the roasted plums, which is pretty much that. Plums, sugar, more vanilla bean roasted in a hot oven for about 20 minutes. 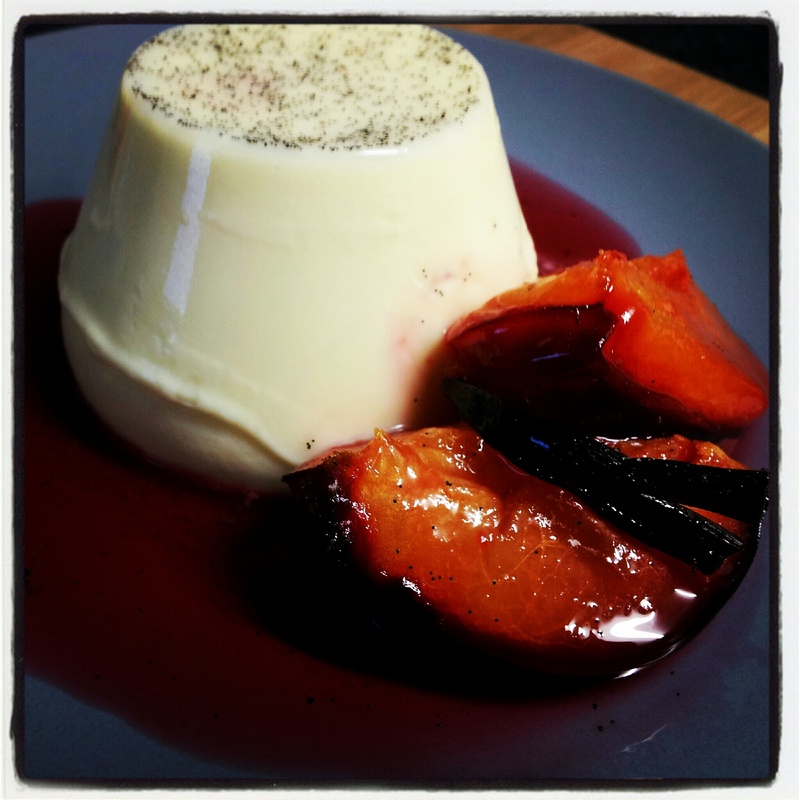 The trickiest part of this recipe is getting the panna cotta out of the dariole moulds. The easiest way I found was to run a knife around the edge of the mould to break the seal, dip the mould into warm water for a minute, turn it upside down onto the plate you want to serve it on and give it a little bang. Ta da! Magic! All the little seeds from the vanilla bean have now settled on top of your panna cotta which makes it look pretty. Add a couple of plums and you have a very good-looking dessert. These two recipes were published in delicious. magazine more than ten years ago, yet they have not dated a bit. If you want to impress somebody, without going to a whole lot of trouble, you must give them both a go. However, after such a decadent dinner last night we are one fruit and salad today! Until dinner of course, where I am planning on using the rest of my fresh egg pasta to make another delicious dinner! Yummmmm! Both look super delicious!! !